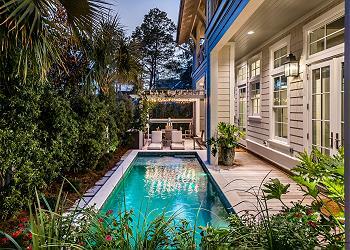 DETAILS: “You Are My Sunshine” is a premier vacation home situated in the exclusive community of Watersound Beach off of scenic 30A along the Emerald Coast. This beautiful home was custom built and professionally decorated and has 5 bedrooms, a bonus bunk room and 5 ½ baths. You can relax in the spacious outdoor living room or in the private outdoor pool. There is an outdoor shower that is available to use when you come back from a day at the beach. The first floor has a large outdoor living room with a large flat screen TV that opens into the main living room inside the house. There is a large gourmet kitchen that has state of the art Sub Zero, Wolf and Bosch appliances. The large granite center island is perfect for gathering in the kitchen. There is a first floor master bedroom with a king size bed and an en suite bathroom and a TV. The second floor boasts 3 beautifully appointed master bedrooms with king size beds and en suite bathrooms and TVs. The third floor is the perfect area for the kids. The first bedroom has a twin and a double bed and the second is a bunk room that sleeps 4. Each bed has its own TV! The common area on the third floor is perfect for the kids to hang out and chill. The fourth floor is the observation deck that is perfect for watching a sunrise or sunset. There are two bar stools and a two-person chaise for relaxing and watching the sweeping views of the Gulf of Mexico. WaterSound Beach is a gated community with 24/7 security, walking trails, private beach access, golf cart access to the beach, putt-putt and a beautiful community pool with a snack bar. 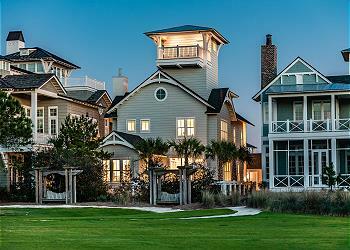 This beautiful WaterSound Beach home is the perfect place to get away and enjoy a piece of paradise with some the most beautiful white sand beaches and dunes in the world. Beautiful home with everything you need for a perfect beach trip!! We are so delighted that you all enjoyed your stay with us in Watersound! Thank you for staying with 360 Blue, we hope to see you again soon!